Levin Papantonio Thomas Mitchell Rafferty & Proctor, P.A. Mrs. Adams joined the law firm of Levin Papantonio in 2005 and earned shareholder status in 2010. Mrs. Adams started her legal career at the firm in 1993 as a busy trial paralegal. Currently, Mrs. Adams focuses her practice on personal injury, mass tort litigation, products liability litigation, wrongful death, and admiralty/maritime law. Mrs. Adams has handled multiple mass tort litigations including FenPhen I, Guidant, Medtronic, Rezulin, Asbestos, Zyprexa, and Yamaha Rhino. She was the lead attorney over a bad drug case resulting in a multi-million dollar settlement for her clients. In 2010, she and her trial partners received the first Plaitiff’s verdict against Yamaha in a Rhino rollover case. Mrs. Adams has assisted with trials on numerous personal injury and product liability trials, some lasting for months at a time. Mrs. Adams is AV® Rated by Martindale-Hubbell®, which is the highest given. Mrs. Adams was also selected to the Bar Register of Preeminent Women Lawyers in 2013. 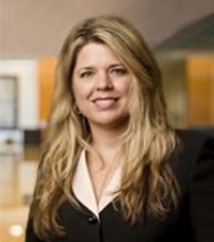 She was named the 2012 President of the National Trial Lawyers: Top 40 under 40, and she was recently named the 2013-2015 President of the National Women Trial Lawyers Association. She is currently licensed to practice law before all Florida state courts, the Northern, Middle, and Southern Districts of Florida, and has been given permission to practice in many multi-district litigations throughout the country. Mrs. Adams stays actively involved in her local community by participating in annual Law Day events, area school law-related presentations, speaking engagements for local paralegal organizations, the Big Brothers Big Sisters program, as well as speaking at MassTorts Made Perfect and other CLE programs. She is a member of the Florida Justice Association’s Women’s Caucus.